There's no doubt about it: summer in Gran Canaria is HOT and July is one of the most popular months for family holidays. If you're looking for hot weather, then July is the perfect month for you. The good thing about summer in the Canary Islands is that during this season the trade winds make their presence felt, which means that the "real feel" temperature will actually make it bearable to stay in the sun during the daytime. But for people who don't like high temperatures and prefer milder weather, July is not a good month to visit and they should probably consider an earlier spring holiday in May or maybe wait until October. The temperatures during the day in July are usually situated between 25°C and 29°C, which may not seem like a lot for summer, but since the UV index is high in the Canary Islands at this time of year, you will go back with a beautiful tan, if you protect your skin correctly from sunburns. During July and August Gran Canaria gets almost no rain and it's a very rare thing to see precipitation during these months. July is one of the most popular months for people coming over with children from all over Europe, taking advantage of the summer school holidays. Many Spaniards from the continent come to visit Gran Canaria in July as well, so keep in mind that summer is considered as high season and prices go up considerably during these months. Besides being warm, the water temperature in July increases considerably compared to the winter months and even spring. But keep in mind that the island is still situated in the Atlantic Ocean, which is never as warm as the Indian Ocean or some other places in Europe at this time of the year (the Mediterranean sea is definitely warmer than the Atlantic Ocean around the Canaries in summer). But swimming is possible, just like it is possible to swim in Gran Canaria even in winter. But for people who are expecting a high sea temperature like in other places in Spain in July - for example in the Balearic Islands - they might be disappointed. The average high temperature in July in Gran Canaria is around 31°C, while at night you can expect temperatures of around 19 - 20°C. The highest temperature ever recorded in Gran Canaria in July (at Airport station) was of 42.6°C and the lowest was of 16.5°C. In July the weather is warm and pleasant all over the island, so you can easily explore all parts of the island, even places where you wouldn't maybe go in other seasons. Rain is non-existent in Gran Canaria in July, so come prepared to enjoy long summer days, with plenty of sun. With 11 hours of sunshine per day, you have almost half the day to enjoy on the beach if you want to. Just keep in mind that with a high UV index of 11, the sun is really powerful and you need to avoid exposure during the midday hours and also protect your skin with a high SPF factor lotion. 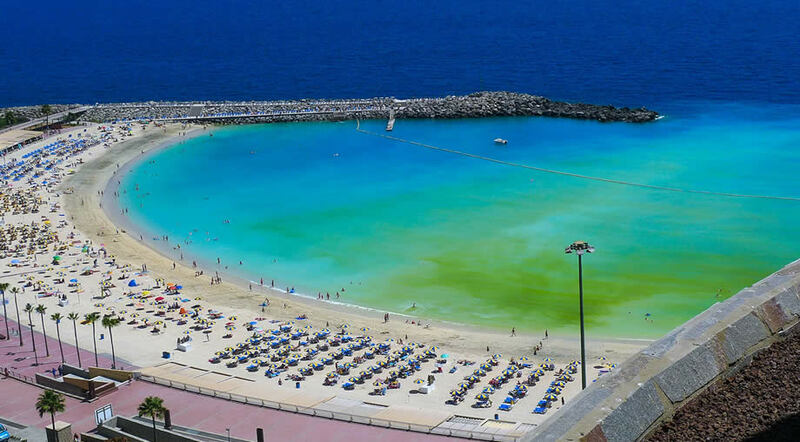 Can you swim in Gran Canaria in July? At 22°C the water temperature is warm enough to enjoy swimming in the ocean or to practice any type of water sports. There are plenty of natural pools and lovely beaches all over the island, so this is the perfect time to explore and discover the most beautiful places in Gran Canaria. The main reason to come over to Gran Canaria during this month is for enjoying the great weather and getting a tan. Swimming, discovering Gran Canaria's best beaches, practicing water sports and going to water parks are great activities for July, as long as you avoid being out during the hottest hours of the day. El Lloret is a popular spot for surfing in the capital of Gran Canaria: Las Palmas. Summer is a great time to choose a different destination than the island's south and maybe take Las Palmas into consideration. And if El Llored is too crowded for your taste you will be happy to know that there are several other spots ideal for surfing in the vicinity of the capital and if you hire a car (which is highly recommended and also cheap), you will be able to reach them easily. This is one of the lesser known attractions in Gran Canaria, but one that is worth exploring especially if you've been before to the island and you want to see something new. This a cave formation with more than 350 cavities, where people used to store their food back in the old days. For a small fee you can visit this place and maybe hide for a few moments from the burning July sun. The celebration of Virgen del Carmen is very important in all the Canary Islands, because she is the patron saint of fishermen. We recommend checking out the festivities in either Puerto Mogan, Las Palmas or Arguineguin, where this event is celebrated for several days and they also have a procession with decorated boats.